Life with Lucie & Ella: Holiday "Not-A-Mantel"
Several months ago, I discovered The Lettered Cottage -- a home decorating blog written by Layla and Kevin Palmer. I love, love, love their style! I have spent far too many hours reading and reimagining my home...without trying out any of the ideas. One of the things that they have featured each season is a new mantel decoration. Check out their Spring, Summer and Fall mantels. So pretty! I love the idea of changing mantel decor to go with the season. But sadly, we don't have a mantel! It's true! We live in a 2-bedroom condo without a fireplace, and therefore no mantel. A very talented neighbor of ours built herself a fake mantel that was beautiful. However, we have far too many BOOKS in this house to give wall space to a fake mantel. 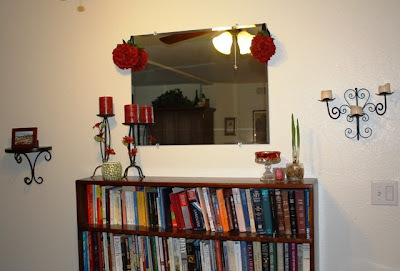 But, rather than continue with imagining and not doing, I decided to create a Holiday "Not-A-Mantel" and substitute one of our mantel-height bookshelves for a mantel! 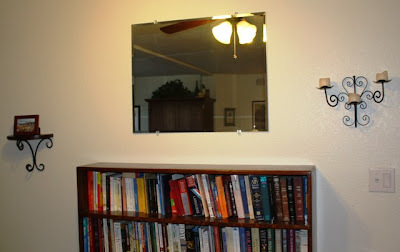 I chose the one near the dining table since it is the focal point when you walk into the living room from both the front door and the hallway. Here is is stripped down. Red rose balls that my sister Jamie made for her "flower girls" at her recent wedding reception. A cute green mosaic candle holder that my husband gave me for my 30th birthday. I just LOVE the shade of green. I also found some other candle holders that we acquired over the years as well as a paperwhite bulb that I planted at my most recent MOPS meeting. 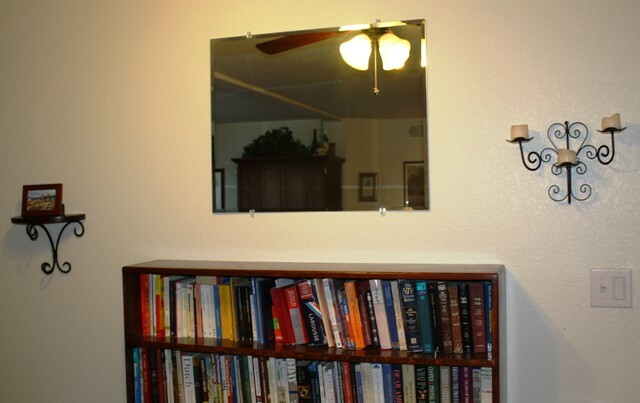 Since the wall is an off-white and the mirror is frameless, I thought the whole project needed a bit more color. 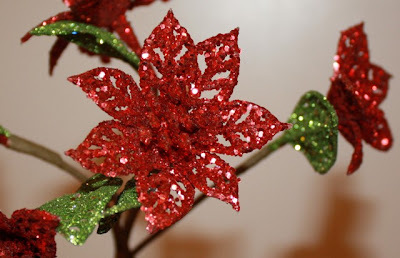 So, I ran off to Rite Aid for some holiday candies and red candles and to Ace Hardware for this "bling" foliage. Ta da! My Holiday Not-A-Mantel! To see some other Holiday Mantels, check out Layla's Christmas Mantel Holiday Party at The Lettered Cottage! How Sweet! You took something simple and made it so special, thanks for sharing!